Don't forget to order your copy of Mom's Pantry's By Heart Cookbook! Volume 1 and 2 and our latest - Tried and True are available HERE! Thanks to Stacey Messina Weiss for sharing this recipe! Mix eggs and sour cream in bowl, set aside. Mix bread crumbs and potato flakes with salt & pepper Heat oil. 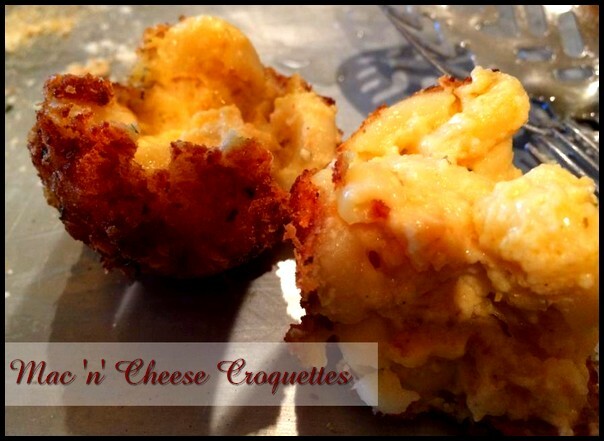 Form Mac n cheese into balls about the size of a golf ball. Dip into egg mix and coat well, be gentle. Dredge gently through the coating mixture. Place into hot oil and let brown well. Remove and place onto paper towel pan and place into oven. Fry remaining Mac n cheese formed into balls. Once done, dust with asiago cheese and serve!